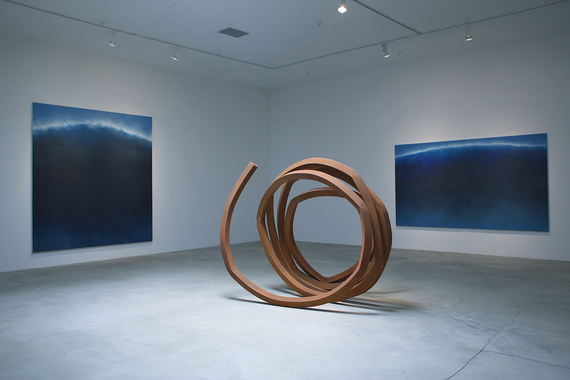 Natalie Arnoldi's paintings juxtaposed with a Bernar Venet's sculpture. Photo by EMS. I don't care about Natalie Arnoldi's age, her gender, or where she came from. She's a painter. 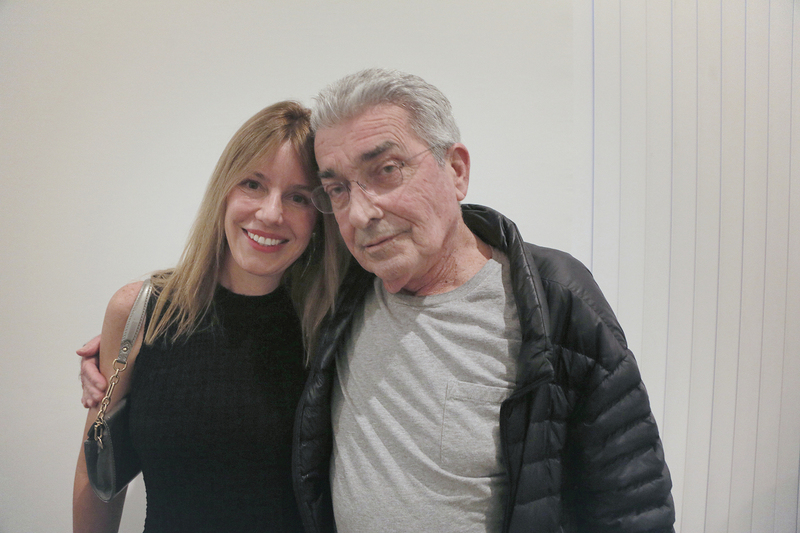 Now that I've said that, there's no doubt she's a good painter and that there's a phenomenal passion behind her work, almost unprecedented, during my survey of Los Angeles's art culture and events. Over the years I've developed a critical eye on what distinguishes a good exhibition to a formidable exhibition. Not only that, 'm a chronicler, and by judging the class of maverick master artists that attended her opening and were willing to give me illustrious quotes on her latest "opaque works" is enough for me. 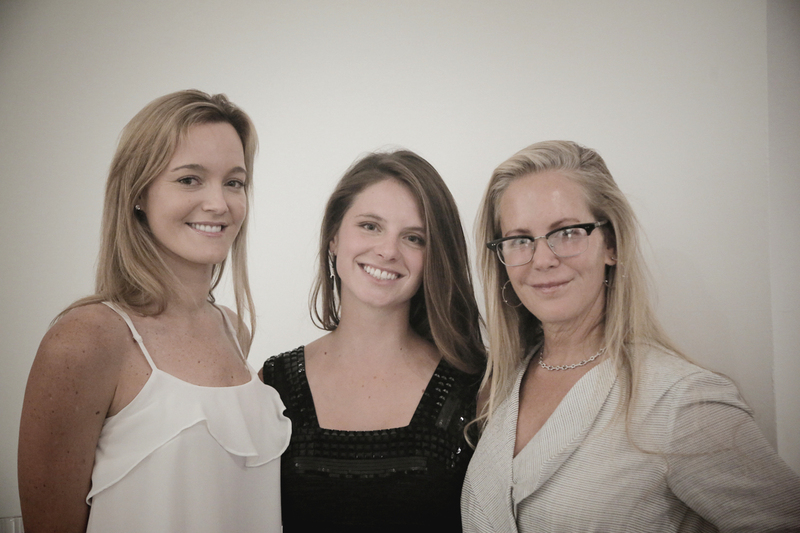 Natalie Arnoldi (second from left) at her opening. Photo by EMS. The history of Ace Gallery is remarkable as the longest-standing Los Angeles gallery-- the only gallery still in existence since the 1960's. The importance of its legendary founder, Douglas Chrismas, cannot be underestimated. 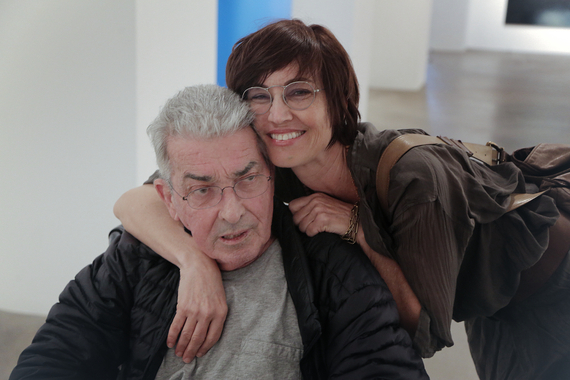 A true veteran of the LA art scene, Chrismas, for over 5 decades has possessed the "eye" for discovering unique talent that stands the test of time and survives the vagaries of market fluctuations, quite an historic feat. Whatever controversial stories you may have heard about Chrismas, he is a tireless and ardent dealer who has an unbridled passion for good art and is blind to gender, age, and other traits-- just look at the roster of strong-willed, successful women artists he represents (Helen Pasgian, Mary Corse, Gisela Colon, Melanie Pullen, Laurie Lipton, etc). Gisela Colon and Peter Alexander. Photo by EMS. Natalie Arnoldi had an opening at Ace Gallery's mega space on mid-Wilshire of Friday, May 1, 2015. If you didn't know Arnoldi, you might have mistaken the work for that of a mature man. She paints sharks, and ocean waves, and railroad tracks, and jumbo jets at sheer 6-foot heights. Her firework paintings reminded me of a summer I worked at Sea World, San Diego where they would shoot fireworks at night under dense marine-layer over the bay. 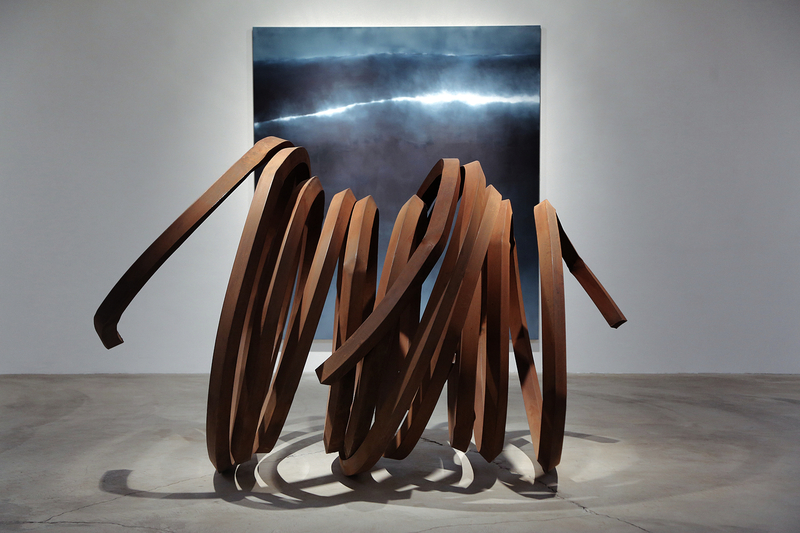 Masculinity filled the rooms that were juxtaposed by Bernar Venet's rolled-steel sculptures. As of now, Ace's space is the largest gallery on the West Coast and in Doug Chrismas' view, size-does-matter. Natatlie Arnoldi's large scale works. Photo by EMS. During the opening, Chrismas told me that he had dinner with Arnoldi and asked her, "Can you take on a space this big?" She replied, "Douglas, I love to paint." He said, "Arnoldi is painting through a unique language, and that the quality of engagement in the language is extremely exciting." Through her "mature painting" he seemed delighted and even gleeful thinking about her next body of work, because now he knows that she can do the job, and that job is to produce a show of large works that will bewilder and mesmerize his patrons and collectors. 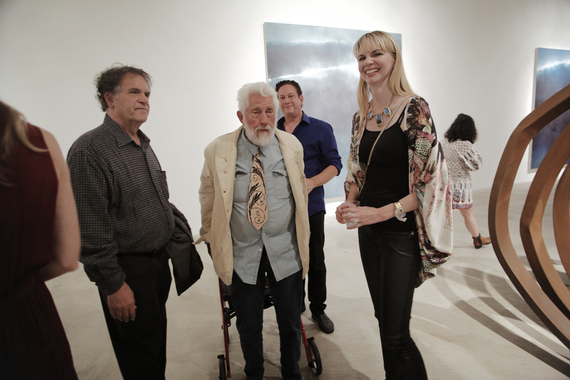 Chuck Arnoldi (center) surrounded by fellow artists. Photo by EMS. 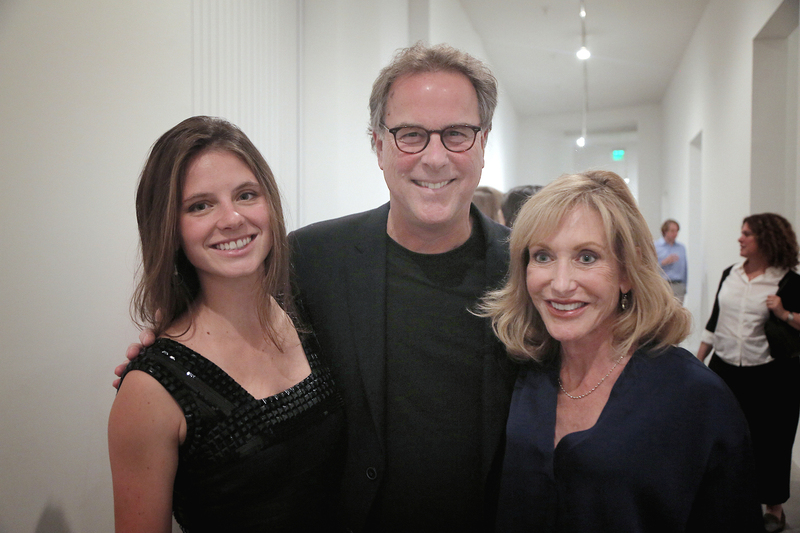 It's no secret that Natalie Arnoldi is the daughter of renowned Los Angeles artist Chuck Arnoldi. If there is anything to envy about this bright young star, it is the priceless mentorship program she went through with her dad and his artist friends. This could also be said of artist Andy Moses, the son of Ed Moses, and of artist Gisela Colon who has been mentored by light & space veteran DeWain Valentine. There's nothing wrong with being mentored by a master artist with decades of history and experience, a privilege unfathomable to all the MFA's that are coming out of today's art schools. After all, my father, a fine art photographer, mentored me when I was a teenager. It is through my mentorship with my dad that I learned the fundamentals of photography and darkroom technique, which separated me from my peers. 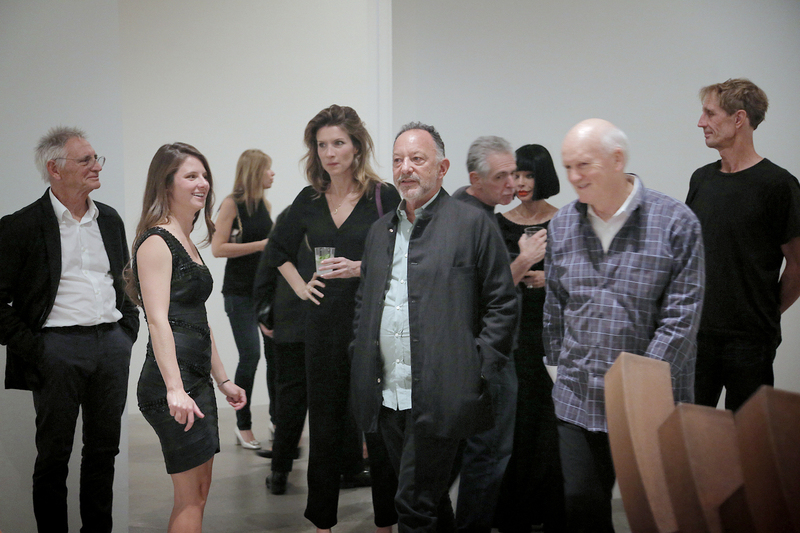 Artists Tony Berlant, Ed Moses, Andy Moses and Kelly Berg. Photo by EMS. Andy Moses has a kinship with artists and seems to treat everyone as his best friend. After all, he married an artist, Kelly Berg. Andy Moses told me the next day that "Natalie Arnoldi's haunting atmospheric paintings of airplanes in the mist as well as deserted gas stations and deserted roads that vanish into nothingness create infinite and constantly shifting levels of mystery. Her equally impressive paintings enormous waves and barely perceptible sharks are at once seductive and inviting as well as moody and menacing. It's amazing to see work by such a young artist that is fully-developed in both idea and technique." Andy told me his father Ed Moses said, "I like the way she grabs mystery." Married artists Peter Alexander and Claudia Parducci. Photo by EMS. Many artists showed up for the historic event. Photo by EMS. 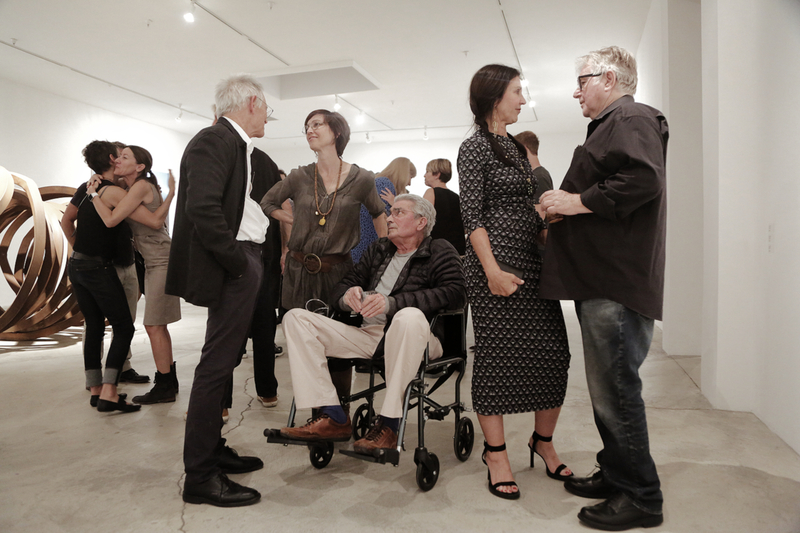 Peter Alexander, who described the paintings as "beautiful light", validated more accolades during the opening. Furthermore, he scans the room and looks at me with his best Clint Eastwood bravado, "How can you not - not like it?' 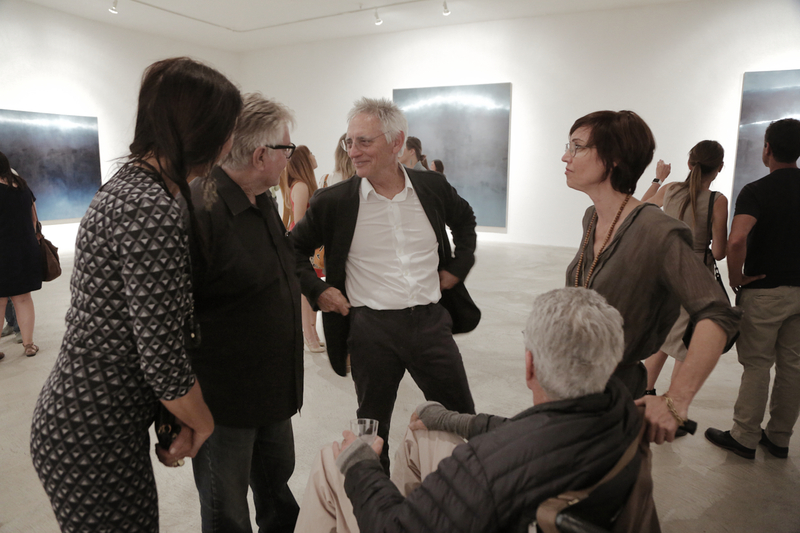 Alexander's wife, Claudia Parducci, also a painter and once showed in a two-person show with Arnoldi a few years back, said, "You sense the density of the marine layer in these paintings. They emanate a very particular silence, as if you are underwater. Her use of light, particularly in the gas station paintings, is reminiscent of driving with the fog lights on." Natalie Arnoldi with her mom, Katie Arnoldi (right). Photo by EMS. 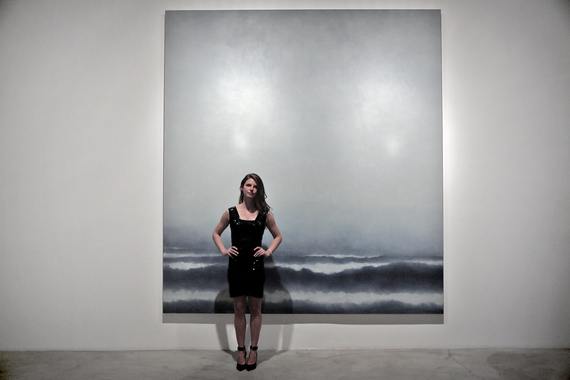 Gisela Colon, who has a current show at Ace Gallery, Beverly Hills, described Arnoldi's paintings as "ethereal embodiments of light and shadow, with an undercurrent of mystery," and compared Arnoldi to artist Mary Corse, who also precociously developed her own mature language at a very young age. Colon explained: "Mary Corse had already created her own unique mature vocabulary at the tender age of 16, and Natalie seems just as talented in her ability to capture the light on a flat surface." 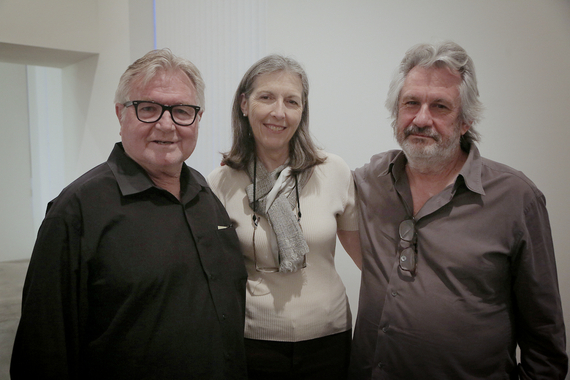 Natalie Arnoldi, Bruce Cohen and Ayn Grinstein. Photo by EMS. Ace artist Laurie Lipton, who also has been challenged by Doug Chrismas' to produce large scale drawings told me, "I think they're haunting (Arnoldi's paintings) and vaguely filled with melancholy," which could be the utmost respect to Arnoldi, because the same could be said about Lipton's work. Laddie John Dill and Jerry Gianportone (right). Photo by EMS. Ultimately, the envy of Arnold's work is not that she may look good in a Hervé Léger dress or that she's a recent graduate of Stanford University with a Masters degree in (Earth Systems specializing in ocean science and policy, and a Bachelors in Marine Biology) or that she shows at a triple canopy gallery like Ace, or that she's been able to produce large scale paintings and realize her dreams.... the real envy is that she can dominate a space and bring glee to a tough-as-nails dealer like Doug Chrismas. The message in Arnoldi's performance at Ace is intimidating, because what it says to artists who have 'paid their dues' is this... if you're weak and timid you can go elsewhere. Formidable. Bernar Venet's sculpture and a Natalie Arnoldi painting. Photo by EMS. This article is part of an ongoing photojournalism survey of art exhibition openings titled EMS N(art)rative. Through my lens I document a photographic essay or visual "N(art)rative" that captures the happenings, personalities, collectors, gallerists, artists and the art itself; all elements that form the richly varied and textured fabric of the SoCal art world. This reconnaissance offers a unique view for serious art world players to obtain news and information on the current pulse of what's in the now, yet capturing timeless indelible images for posterity and legacy. Here is EMS N(art)rative Twenty-Four.